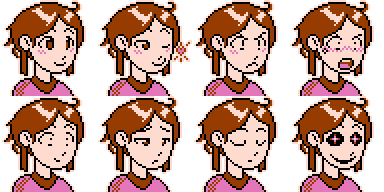 These are RPG Maker VX Ace format portrait facesets intended for an NES-style RPG. 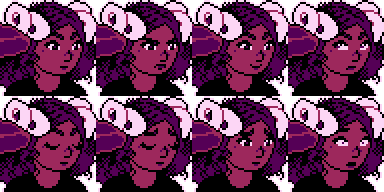 Each portrait is limited to three colors (not including black) in an attempt to be faithful to NES graphical limitations, and is scaled up 2x to replicate NTSC screen resolution. 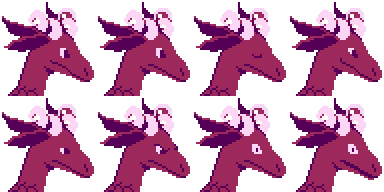 The original resolution of each portrait was 48x48; after 2x scaling, the final size for each portrait is 96x96. Edit: I was able to locate the original working source files for the facesets, so I've uploaded some sheets constructed from the original 48x48 portraits, labeled "orig1x". Hopefully this way no one will have to downscale the VX Ace facesets to get something they can work with in other engines. Credit can be attributed to "Ctskelgysth Inauaruat", "Ctskelgysth", or just "Ctske" depending on space limitations and what works best for your project. adorable! Though I recommend not upscaling it since that job can be done in a game engine or video editor (depending on where its used). I hope you make more of these in the future! Unfortunately, the game engine of the project these were originally made for is not capable of upscaling internally, so manual upscaling was necessary to replicate the resolution of an NES game. These files were retrieved directly from the game project, which is what I had on hand. I'll have to dig into my backups from last year to find the original resolution files that I was working from if I'm going to share them as well. Thats bizarre, what engine is it? Also I personally downscaled it myself, makes a wonderful template! I used it to attempt mugshots for my character and they came out pretty well! Once again I hope you post more like it in the future!